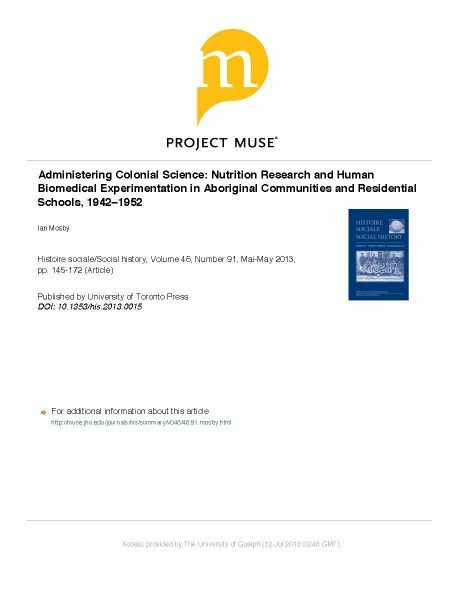 Between 1942 and 1952, some of Canada’s leading nutrition experts, in cooperation with various federal departments, conducted an unprecedented series of nutritional studies of Aboriginal communities and residential schools. The most ambitious and perhaps best known of these was the 1947-1948 James Bay Survey of the Attawapiskat and Rupert’s House Cree First Nations. Less well known were two separate long-term studies that went so far as to include controlled experiments conducted, apparently without the subjects’ informed consent or knowledge, on malnourished Aboriginal populations in Northern Manitoba and, later, in six Indian residential schools. This article explores these studies and experiments, in part to provide a narrative record of a largely unexamined episode of exploitation and neglect by the Canadian government. At the same time, it situates these studies within the context of broader federal policies governing the lives of Aboriginal peoples, a shifting Canadian consensus concerning the science of nutrition, and chang- ing attitudes towards the ethics of biomedical experimentation on human beings during a period that encompassed, among other things, the establishment of the Nuremberg Code of experimental research ethics.